If your life is anything like mine (busy, busy busy!) you may not have made any plans this Valentine’s Day. And there’s not any real reason, except we’re busy working parents, that we chose to not “go out” and celebrate this Hallmark holiday. We may decide to celebrate a different day, or I may just enjoy a glass of wine tonight and say that’s good enough! But if you’re “go out” people and today just wasn’t a good day, fear not! There are always fun and romantic things to do no matter the season. Denise offered to share this post with me. She owns a spa in Ottawa, Ontario. She’s created for us a lovely post of romantic spots in the Nation’s Capital – and they’re for everyday! With Canada’s sesquicentennial this year (that means the country is turning 150!) Ottawa is going to be the place to be. Take a look at the lovely post Denise has crafted, and then share with me if you’ve been to these beautiful locations. They all sound wonderful for a romantic getaway in Ottawa. 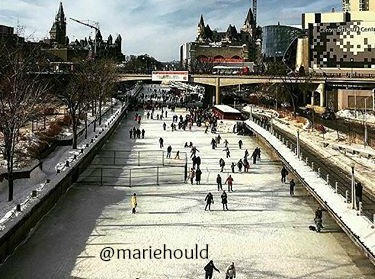 I have been skating on the Rideau Canal, but it’s been many many, years! Valentine’s Day is behind us but that doesn’t mean the love isn’t in the air anymore. If you missed making plans, or if you just couldn’t fit it into your schedule, worry not. Ottawa holds abundant romantic attractions for couples. The capital of Canada is known for its unique and elegant attractions. If you’re making some late plans or just weighing your options, this post will give you a few of the most amazing places to make some lifelong memories with your loved one. Here are some of the romantic spots in Ottawa to spend a couple of memorable days. The Rideau Canal, a world heritage site, is a 126-mile long waterway that connects Ottawa and Kingston. The frozen watercourse is a major attraction for couples at this time of the year. People love to enjoy skating and skiing on the snow-filled lands. You can rent a pair of skates, and glide on the world’s biggest skating rink! If you are a ski lover, then this place will re-ignite the fire of passion and love in your relationship. You can enjoy delicious cuisines for a candlelight dinner. This place is highly recommended by couples that visit it from all around the globe. Not every Valentine’s Day has to be an over-the-top affair! You can also spend it in a much more relaxed and casual mode, by spending a spa day together. With the rise of stress in our lives, spa days are becoming more and more popular among power couples as well – it’s no longer just a best friend thing! You can find a wide range of spas in Ottawa; without shelling out big bucks, and you can enjoy a day filled with massage, scrubbing, sauna bath, and much more with your partner. If your partner is an outdoor lover, then Gatineau Park might just be right for you! This is a place where couples can go biking, canoeing, and hiking. Also known as the best place for skiers, it is one of the most fun spots for couples that appreciate skiing. You will not only get to spend some quality time with your partner but you will also make some crazy and fun memories. Are you one of those couples who are not into outdoor activities? Playing casino at the hottest bar in Ottawa might be just right for you this Valentine’s Day! You can play your favourite poker game and enjoy live performances from elite stars from all around the world. Whether you lose or you win, the thrill of playing will rejuvenate the fun factor in your relationship. Get all dressed up and hit the casinos to make some real money this year! A gambler couple is always a fun one! Looking for the best cultural and political spot in Ottawa that is also kinda gorgeous? Then Parliament Hill is the one for you! Its gothic-style architecture and the view of the magnificent Ottawa river gives it a perfect, romantic touch. Spend a night in these luxurious rooms and plan the most romantic night of the year filled with passion and extravagance. Wake up to their special continental breakfast in the morning and make memories that will last for a lifetime. Whether you plan to visit Ottawa for a romantic getaway or if you live here and have never done some of the things on this list, now is as good time as any to break from your daily routine and enjoy a fun day with your partner. Whether you’re an adventure junkie or a low-key lover, you can find many kinds of experiences in this beautiful city. Denise C. Silva is a small business owner at Atlantis Spa Ottawa the most established beauty spa and salon in Ottawa, Ontario. When not at the spa she is an avid social media fan. She would love for you to come visit her spa when spending a romantic getaway in Ottawa. Sounds like a fun place to visit. I have never been anywhere in Canada, but I would like to someday. What I like is that there are fun things to do for all seasons. Thanks for leaving me a comment Barrie.